Most of the electronic circuits using relay's for the purpose of switch. If the electronic circuits operated by battery source external load is on the battery source when the relay operates means switch function causes power consumption takes place in this mode. 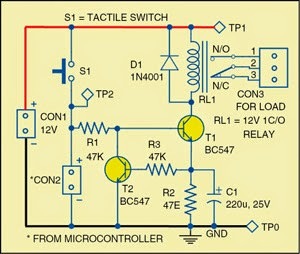 overcome this problem by using relay driver circuit. Figure shows circuit diagram of the power-saving relay driver where resistor R1 and transistor T1 form a standard relay driver circuit. the relay is energised, its pole is pulled in to make contact with the N/O side, and it holds in that position with typically 75 per cent of its nominal-rated voltage. When power is applied, capacitor C1 momentarily shorts resistor R2 and allows full voltage across the relay to pull the pole contact, and then slowly the current through the capacitor drops. Resistor R2 takes care of the current, ensuring it is just sufficient to hold the relay. The constant current mechanism formed by transistor T2 and resistors R2 and R3 effectively drives the relay at very less power. Transistors T1,T2 - BC547 npn. Resistors - 1/4 th watt. C1 - 220 micro farad 25v. 0 Response to "Relay Driving Circuit"